Jon Norton is a semi retired clergyman affiliated with the Reformed Church In America. 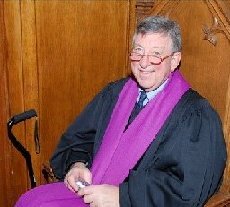 He served three churches in the Metropolitan New York City region: Fort Lee NJ, Hackensack NJ, Spring Valley, NY and for 20 years was the Executive Minister of the Regional Synod of NY, Reformed Church In America. He has had a long association with Rural & Migrant Ministry. He is currently the treasurer of the Council of Churches of the City of New York, and was a member of the New York State Council of Churches, through his work with the Regional Synod of New York. In his work for the Regional Synod his responsibilities included working directly with 160 Reformed Church. Even though he only speaks English, he dealt with ethnic congregations where the primary worship service was carried out in 12 different languages. Pastor Norton is very attuned to working with different cultures other than his own. Reverend Norton is married, with two grown children and two grandsons.